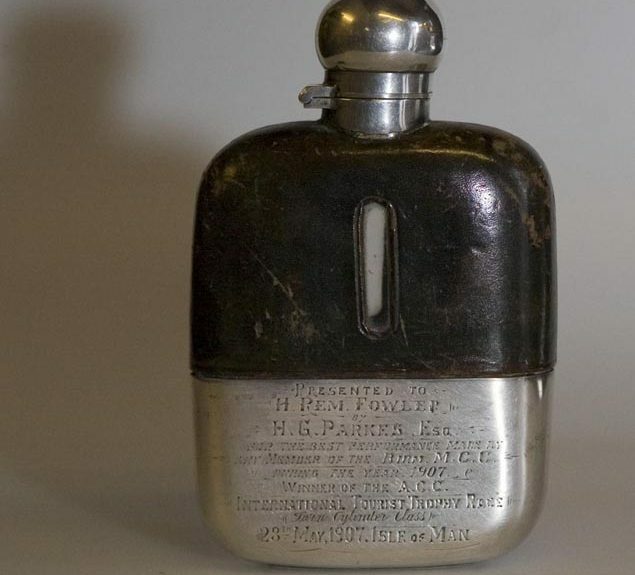 The national heritage agency for the Isle of Man, Manx National Heritage has secured an important new acquisition for the national collections, the silver hip flask awarded to Rem Fowler for his win in the first ever TT race in 1907. The hip flask was secured at Bonhams Autumn Stafford Sale and is one of the oldest pieces of Isle of Man TT heritage in existence. “Memorabilia from the first Isle of Man TT race is extremely rare. There were no individual trophies, no medals awarded and no specialist racing equipment. Apart from the St Mars Trophy, which is still awarded for the Senior TT, this engraved flask is the only known piece of material culture”. “I was in no fit state to ride for I was in a very run down and nervous condition… A friend of mine fetched me a glassful of neat brandy tempered with a little milk. This had the desired effect and I set off full of hope and Dutch courage”. The rough roads, often little more than rutted cart tracks, meant that the earliest Tourist Trophy races were a trial of reliability as well as speed and fuel economy. They were a testing ground for road-going motorcycles. The first twin cylinder TT race was won by Rem Fowler on a Peugeot-engined Norton, while a Matchless, ridden by its manufacturer Charlie Collier, won the single cylinder race. 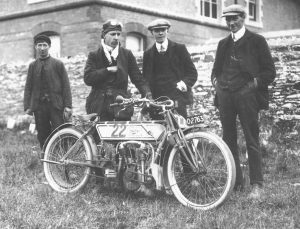 Rem Fowler, above second left, winner of the 1907 first twin cylinder TT pictured with his TT winning Peugeot engined Norton. The hip flask had previously been loaned to Manx National Heritage in 2007, when it was displayed as part of ‘Staying the Course’, an exhibition celebrating 100 years of the TT. As well as giving curators a chance to examine it closely, it was one of the star exhibits of that exhibition and featured as an illustration in the souvenir catalogue. “With over 110 years of history, the TT is at the heart of the cultural identity of the Isle of Man. In the last few years we have accelerated our programme of collecting to make sure that key races, riders and events of the TT are represented. The sale of the hip flask generated a great deal of interest amongst collectors in America so we were worried that it might leave the British Isles and the public might never see it again. Trustees were therefore prepared to use their reserve funds to secure it for the nation and bring it back to the Island. I am very pleased and indeed proud that we have succeeded. Manx National Heritage is a charity and acquisitions like this are only possible with the help of all those who have donated or bequeathed funds to the Trust”. MNH will find an opportunity to showcase this and other new acquisitions as soon as possible – probably at the time of TT 2019. A new TT gallery at the Manx Museum is in the early stages of development and MNH is keen to talk to the motorsport community to make sure all elements of the TT are represented in the national collections and the new gallery.